I am learning the hard way that Atlanta doesn’t do fall. The weather this past week was still pushing 80, which is nothing short of pure insanity for someone who has spent her whole life near the 40°N line. My calendar says that it’s nearly November, but I can still wear shorts to class. Seriously, what is wrong with this place? If the weather won’t cooperate, I will turn my kitchen into fall instead. I’ve been roasting vegetables and making hearty soups, drinking crisp apple cider and sipping piping hot tea in the mornings when the warmth of the sun has only just kissed the city and I can briefly, fleetingly pretend that I need to wear boots today. And then, of course, there is pie. What is fall without fresh pies? It’s like fall without apple picking (see: my fridge still full of Galas and Arkansas Blacks), or worse, like fall without Halloween. This aromatic pie filling comes from Alton Brown, poured over the ever-reliable all-butter crust from smitten kitchen (thank you, Deb!). 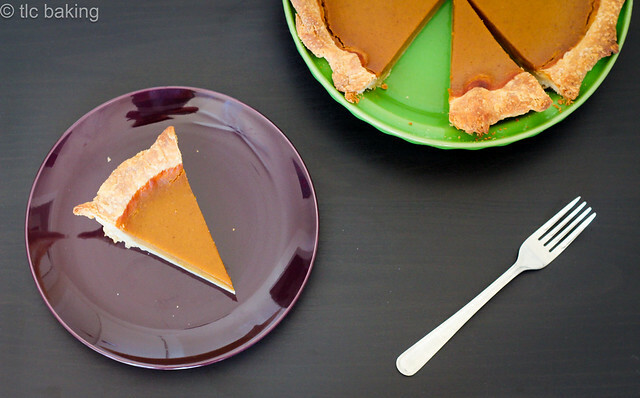 You can absolutely make it with canned pumpkin (not pumpkin pie filling!) instead of fresh pumpkin puree, but going with the fresh stuff will give you a more subtle, earthy flavor. In the interest of full disclosure, I should tell you: I barely did anything to make this pie. The boyfriend was visiting for the weekend, and while I had my nose buried in problem sets all day, he roasted and pureed the pumpkin, prepped and chilled the pie dough, and whisked together the eggs and brown sugar. I stepped in momentarily to spice and finish the filling and to roll out the crust, but the actual baking was all done by him while I was in class. So really, I cannot take any credit for the need to eat multiple pieces of this deliciousness in a row. I can, however, tell you how to make this pie yourself. Step one: Go pumpkin picking. Hunt for pumpkins still on the vine, so that you can have the joy of clipping one off yourself, stem still bright green when you place it on your counter at home and promptly forget about it for weeks. Grab a pie pumpkin from the store at the farm too. 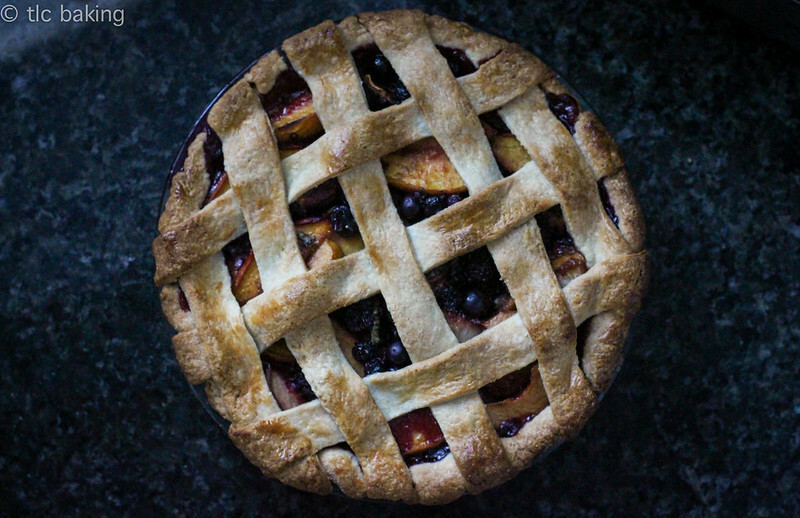 Bring it home and stare at it longingly until your need for pie overwhelms your senses. Step two: Clean and roast your perfect and adorable pie pumpkin until your kitchen smells heavenly. 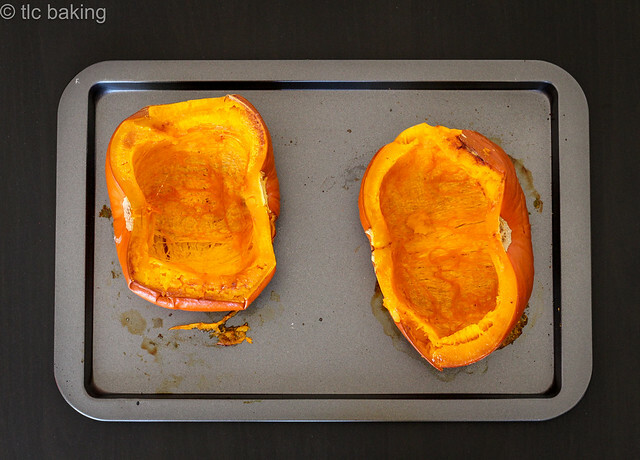 As with any good roasted squash, just a touch of olive oil and salt will do the trick. 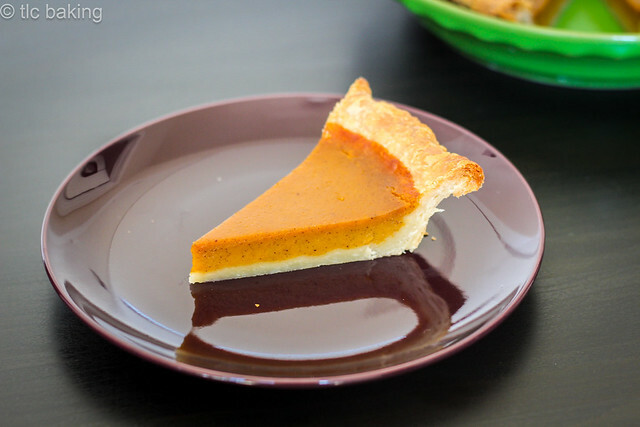 Stick your nose in the still-steaming pumpkin and contemplate abandoning the pie and just eating it with a spoon. 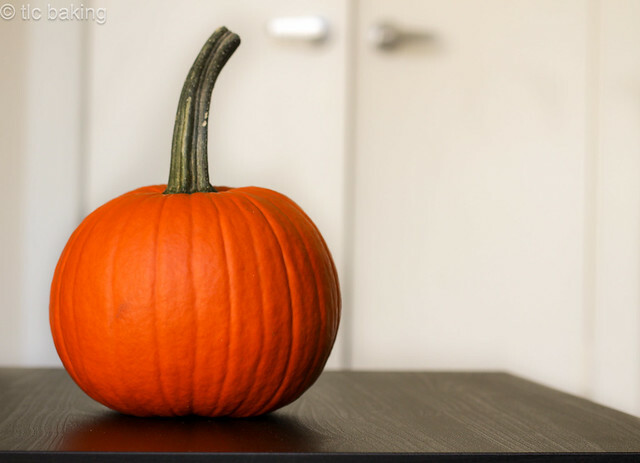 Make the right choice for your future self and make the pie dough instead while you wait for the pumpkin to cool. Step three: Puree your pumpkin and parbake your crust. 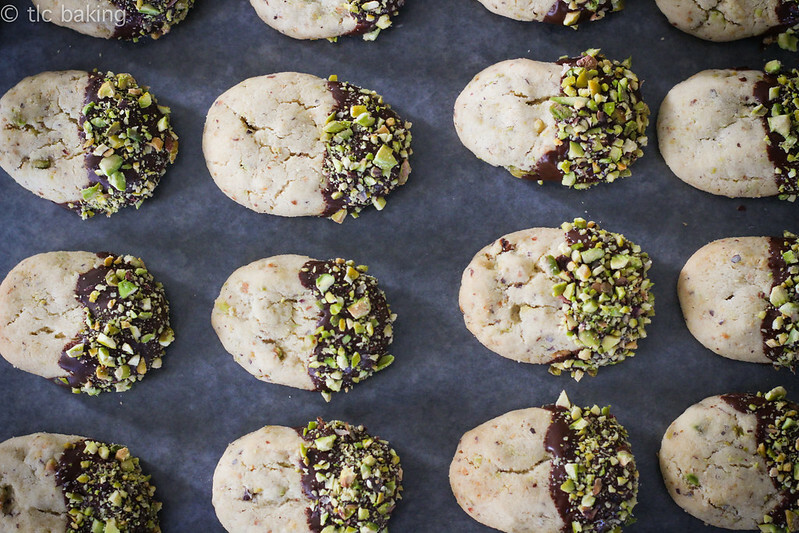 Do this twice, because you accidentally skimped on the dough the first time and you ended up with a shrunken crust that couldn’t possibly hold enough delicious filling. Ponder your options for the funny-looking crust while the second one sits in the oven, even though you know you’ll most likely just eat it as is or with some jam. Step four: Make your pie filling. Warm the puree over the stove, marveling over the slop-plop of the heat trying to escape through the thick pumpkin. Stir in half-and-half and the just-right blend of spices that make you think of tall socks, crunching leaves, changing winds, and daylight savings. Whisk together some eggs and sugar and slowly, carefully, combine the two mixtures while imagining how funny your pie would be if you accidentally scrambled your eggs before baking. Step five: Bake the pie. Try to do work. Smell the unadulterated aroma of fall filling your aparment and stop fooling yourself. Keep checking the timer and the oven, forgotten textbook still lying open on the coffee table. Jiggle the pie. Wonder what “just jiggles in the middle” really looks like. (If you have to ask, it’s not there yet.) Immediately remove the pie at the right amount of jiggle and admire it, feeling your heart warm. Anxiously wait until it’s cool enough that you won’t irrevocably burn yourself trying to eat it. Step six: Cut the pie. Eat the pie. Share the pie. Love the pie. Or, in my case, thank your boyfriend for making the pie before promptly scarfing down a piece and losing yourself in the taste of the season you so desperately crave. Admittedly, my filling-to-crust ratio is not right. I still sometimes roll out wonky pie crusts that aren’t of uniform thickness, and looking at the photos makes me think I should’ve used the full batch of filling even though it would’ve nearly touched the brim of the crust. Midterms on the brain clearly do not help with important baking decisions. As for the spice mix, I estimated and adjusted in a small bowl until it smelled right to me, so feel free to experiment depending on just how much of a nutmeg person you are. Let me know if you make the pie, or if you have another quintessentially fall recipe that I must try as I attempt to convince the temperature to drop before Thanksgiving. If starting with pie dough, roll out enough crust for a 9" base with some dough hanging over the edges of your pan. Trim and crimp the crust as desired, then chill it in the fridge while you preheat your oven to 425F. Parbake for 12 minutes, weighing down the center of the crust with pie weights, pennies, or uncooked beans (I used dry lentils). Set your oven to 300F. Heat the pumpkin puree in a medium saucepan. If it's very thick, it won't get to a simmer, but heat it until you can see the steam escaping as you stir it. 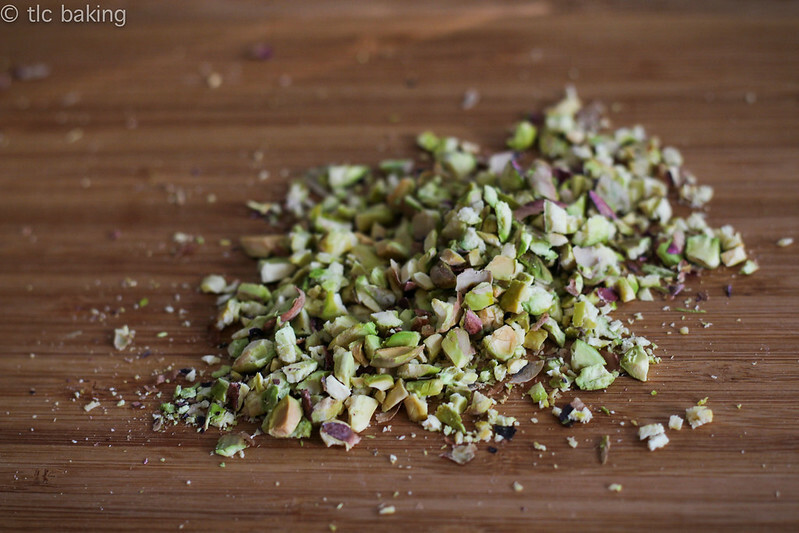 In a small bowl, mix together the salt, cinnamon, nutmeg, ginger, and cloves. Adjust to taste/smell. Add the half-and-half and spice mix to the puree and stir well. Remove mixture from heat and let cool for 10 minutes. In a large bowl, whisk together the brown sugar and eggs until very smooth and shiny. Add the pumpkin mixture to the sugar and eggs, starting with a small amount and whisking frequently so as not to cook the eggs with the warm pumpkin. Pour the filling into the still-warm crust. Place in the oven on a baking sheet (in case of spillage). Bake for 40-50 minutes, until the sides of the filling are set but the pie still jiggles just in the center. Let cool (let it cool!) before slicing and serving. The pie will be arguably even better the day after it is baked, but will start to get stale after 2-3 days. Bear with me for a little life update. If you follow my facebook presence, you know that tlc suffered a big setback in May, due to my own idiocy, bad Internet in Turkey, and my tendency to not back anything up. 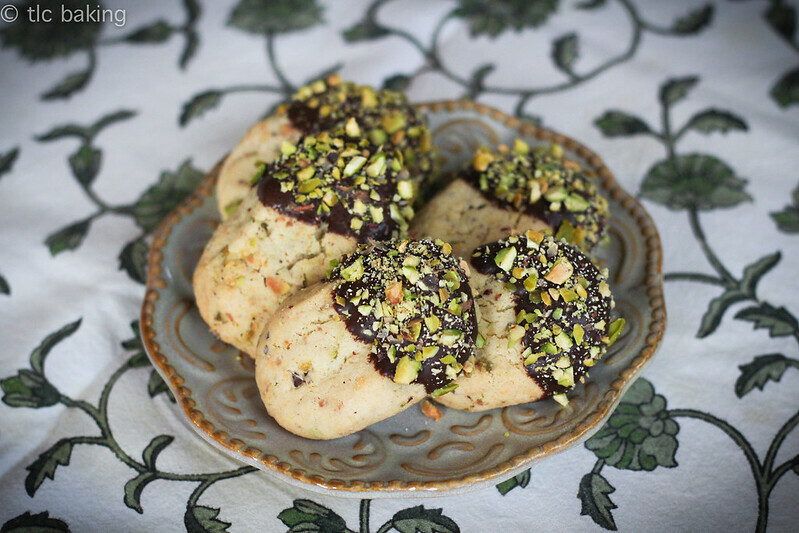 Thanks to the old WordPress-hosted version of the blog and the glory that is this Internet archive, I managed to recover or re-post everything except my two most recent recipes. So if you’re looking for the banana bread two ways or the mouth-watering deliciousness that was the big crumb coffee cake–I’m sorry. Hopefully I’ll remake them one day, but for now, I’d like to just move on and keep churning out new things. If you’re looking for the originals, however, this is the brown butter banana bread, this one is the Earl Grey banana bread, and here is the coffee cake. I wish I had written down the tweaks I made somewhere else, but really, I lost everything with all three recipes. The fact that I only lost those two posts, though, is 1) a miracle considering how much more I could’ve lost, and 2) an indication of how deeply neglected this blog was for most of this year. I still baked and cooked plenty between January and now. Birthdays, dinner dates, and study breaks always brought me back to the kitchen. But nothing ever quite made it into written form. Simply put: I had a rough winter. And after that rough winter, I had a magical, incredible, inspiring 9 1/2 weeks in the beautiful city of Istanbul. 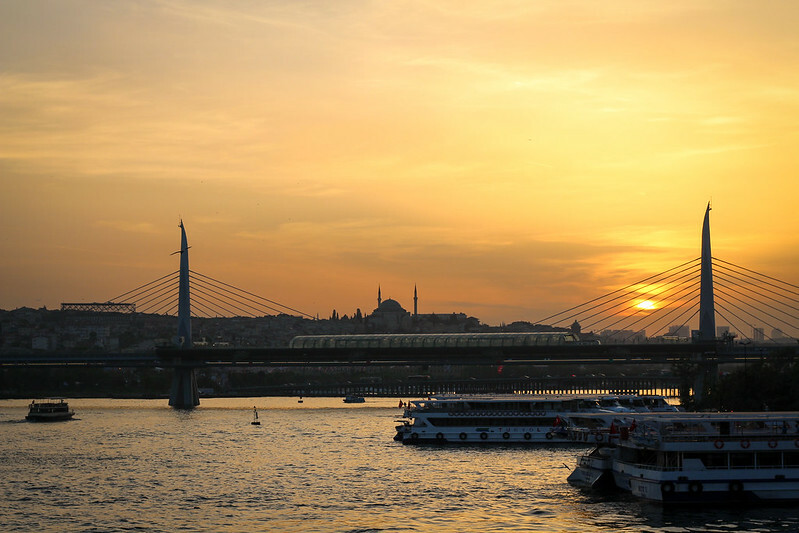 Studying abroad in Turkey was a once-in-a-lifetime experience in a place that will forever find its way into my dreams–a place that I miss every day. 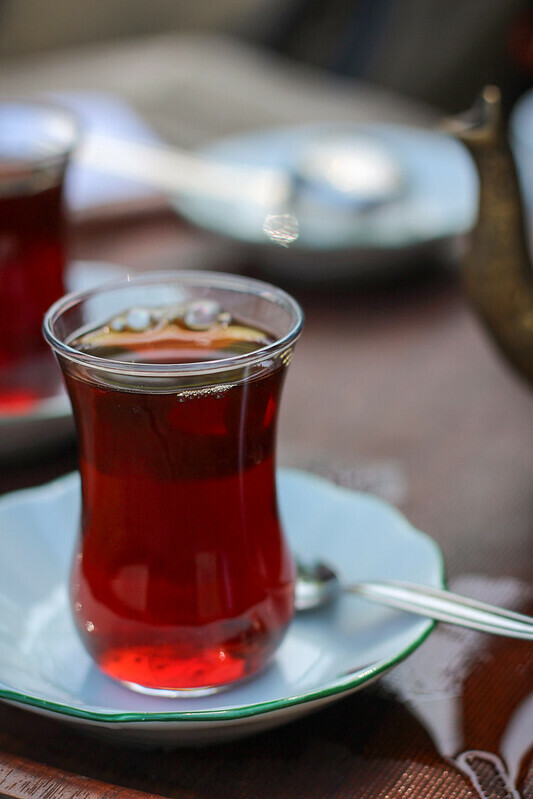 What I wouldn’t give for another sunset along the Bosphorous; for another cone of thick, creamy, rich pistachio ice cream from Ali Usta; for another smile and cup of çay from the heartwarmingly welcoming family of the Ortaköy Mantı Evi. Unfortunately, a side-effect of studying abroad was, as I mentioned, terrible Internet, which meant I couldn’t even upload photos for a throwback post if I wanted to. Follow that spring up with losing my old blog and a lackluster summer with nearly nobody to bake for, and it isn’t surprising that I lacked motivation. That is, until this pie. It started at the boyfriend’s house earlier this month. We went fruit-picking at a nearby farm, and found ourselves facing the fattest, sweetest blackberries I’ve ever seen in my life, followed by line after line of yellow and white peach trees. 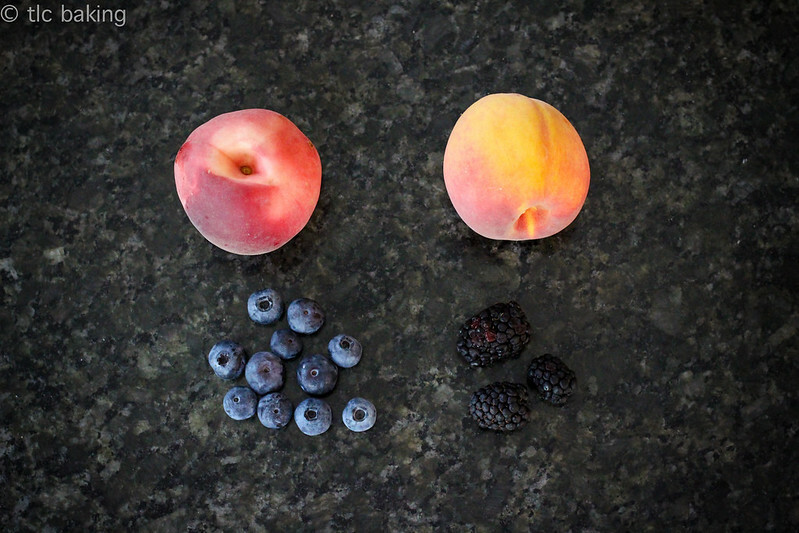 Peaches and blackberries? Now that’s a combination begging for pie, we mused. 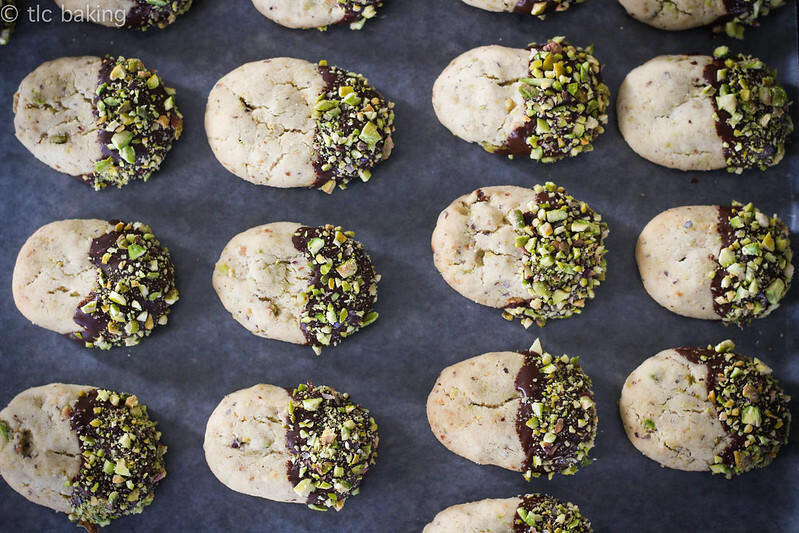 We headed back to his house and immediately started on the dough, using the ever-reliable smitten kitchen’s recipe. Summer pie, part 2: now with blueberries! Pie. Sweet, warm, fresh pie with an earthy, herby touch that makes you want to bury your face in it as soon as it comes out of the oven. We dug into it after a few hours of cooling, pairing each slice with a generous scoop of ice cream. 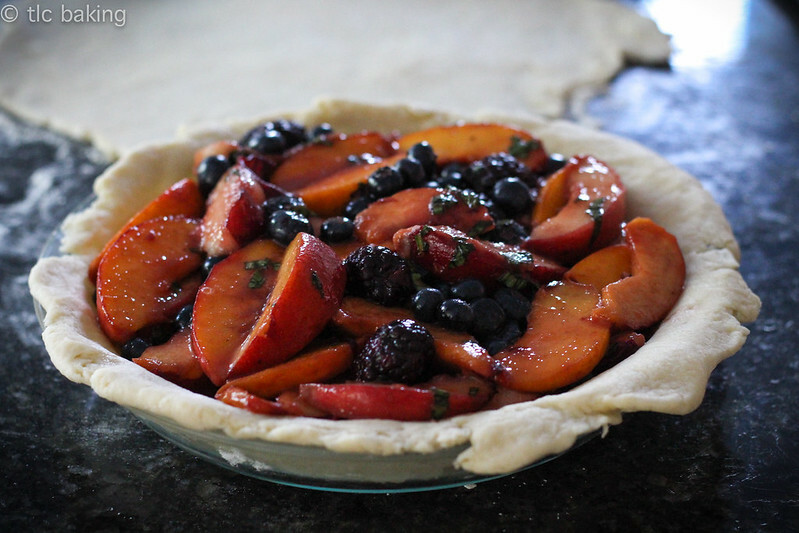 When I made it again a couple weeks later, tempted by the extra-ripe peaches quickly browning on my kitchen counter, I only had a tiny box of store-bought blackberries to work with. Nowhere near the same effect. Blueberries were thrown into the mix, the lemon was swapped with lime, and after many fingers tested the mix, I had the very satisfying recipe you’ll find below. 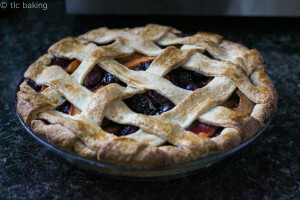 Round 2 of my new favorite pie, this time latticed and shared with a friend in her brand-new apartment. 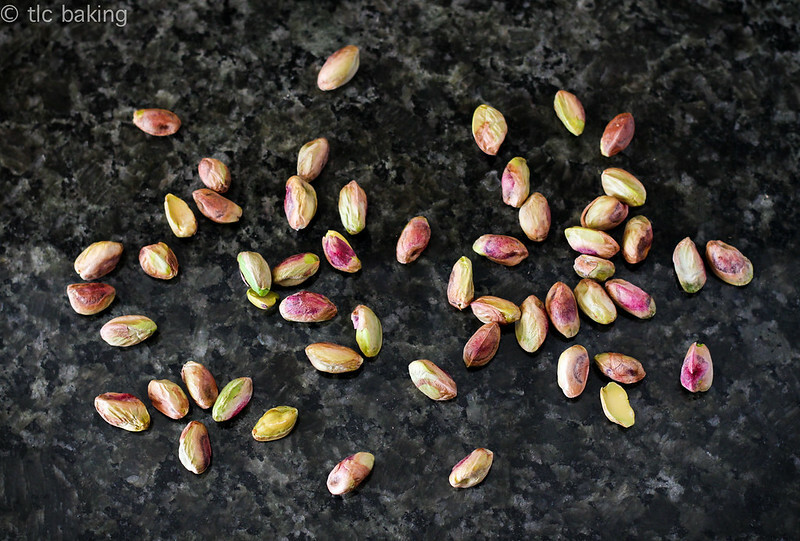 The filling is forgiving and very much dependent on the fruits you have handy, so I highly recommend adding and stirring and tasting until you get a sweet, juicy flavor with just the slightest hint of basil underneath. And move quickly–the season is almost up! Until next time, here’s wishing you sunny days, cool nighttime breezes, and an abundance of summer fruit before fall sneaks up on us. Slice your peaches thinly, then combine all of the fresh fruit in a large mixing bowl. Add the brown sugar, salt, and vanilla, then stir gently with a spatula so that all of the fruit is coated. Add 2 T of white sugar, all the lemon juice, and the chopped basil leaves, then stir well. Taste the filling, and add the remaining 2 T of white sugar as needed. Add cornstarch and stir well, making sure there are no lumps of starch anywhere. Prep a 9-inch pie plate with your dough of choice. Roll out half of the dough, big enough so that you have some dough hanging over the edges of the plate. 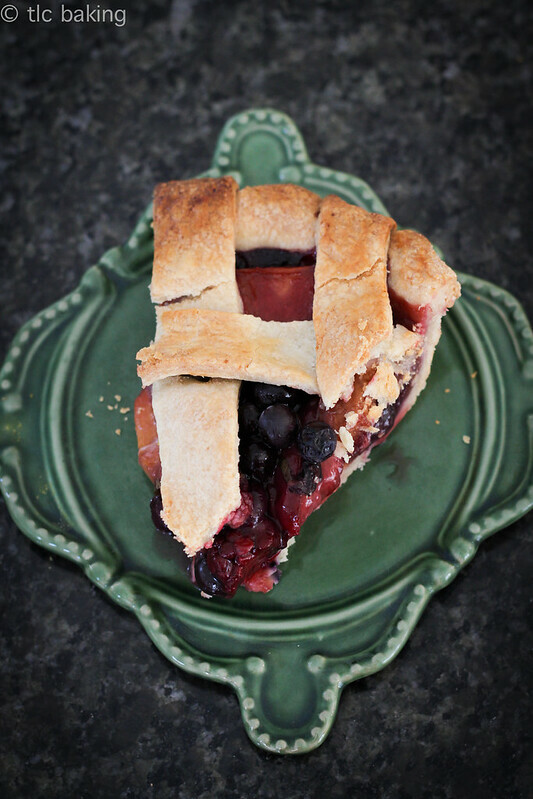 Using a slotted spoon, add your filling to the pie plate, spreading the fruit out evenly. Make sure you don't pour too much of the filling juices into the pie, or it'll get soggy and sticky. Roll out the remaining pie dough. 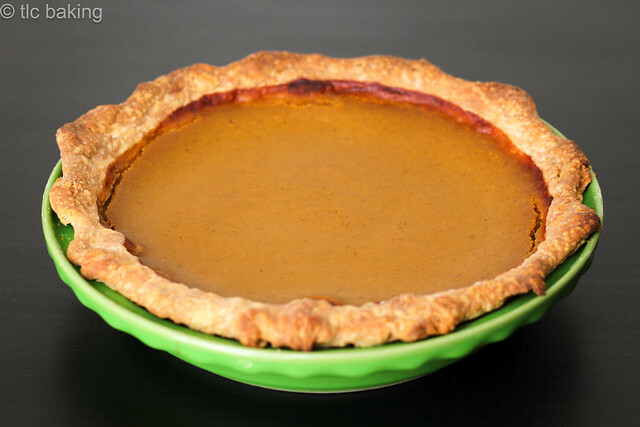 You can cover your pie however you want; just make sure you cut some air holes if you decide to completely cover it. Put the pie plate on a cookie sheet, then bake it for 15 minutes at 400F. After 15 minutes, reduce your oven temperature to 375F and bake for another 30-40 minutes, until the top is golden brown and the filling is bubbling. Let cool for 3-4 hours before slicing and serving. Don't forget to taste as you go! The sweetness or tartness of the fruit should guide you. If it doesn't entice you, feel free to tweak the quantities until it does.